Welcome to Taurus Home Page! 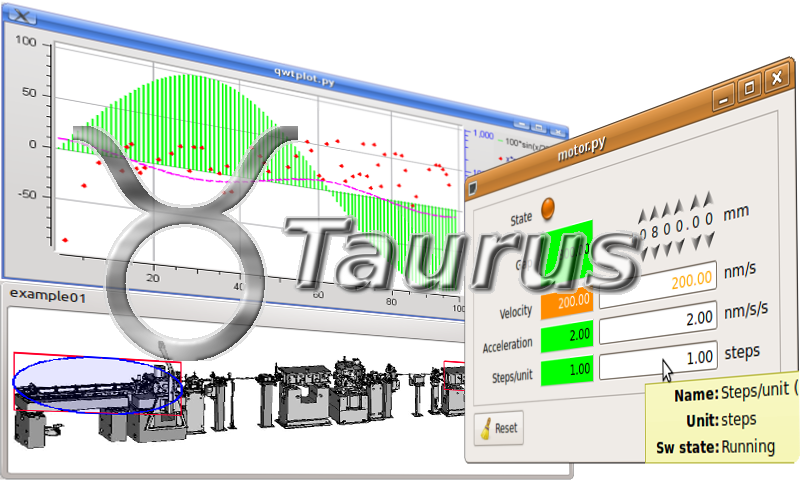 Taurus is a python framework for control and data acquisition CLIs and GUIs in scientific/industrial environments. It supports multiple control systems or data sources: Tango, EPICS, ... New control system libraries can be integrated through plugins. For non-programmers: Taurus allows the creation of fully-featured GUI (with forms, plots, synoptics, etc) from scratch in a few minutes using a “wizard”, which can also be customized and expanded by drag-and-dropping elements around at execution time. For programmers: Taurus gives full control to more advanced users to create and customize CLIs and GUIs programmatically using Python and a very simple and economical API which abstracts data sources as “models”. Of course, Taurus is Free Software (under LGPL). You can download it from PyPi, access its Documentation or get support from its community and the latest code from the project page. See also the related Sardana project, which uses Taurus to build its user interfaces.